Observation - Reed Bunting - UK and Ireland. Description: Difficult to see from the photo as the head is mainly hidden by the reed but we saw his black head and that combined with the brown speckle detail on the body just below the wing led us to believe it is a Reed Bunting. 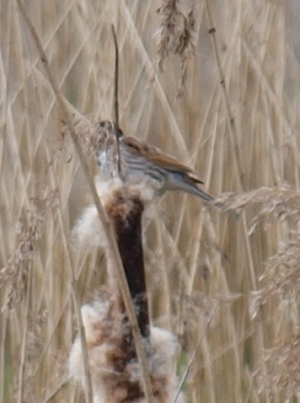 Difficult to see from the photo as the head is mainly hidden by the reed but we saw his black head and that combined with the brown speckle detail on the body just below the wing led us to believe it is a Reed Bunting.